The Scottish Vocational Qualification (SVQ) in Food and Drink Operations (Automated Plant Bakery Skills) at SCQF level 5 provides learners with the knowledge and skills required to work in the food and drink manufacturing sector. It is aimed at staff using automated plant bakery technology in bakeries. There are two mandatory Units covering food safety procedures and health and safety in food manufacture. 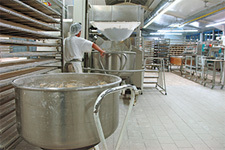 The optional Units provide the opportunity to tailor the qualification to meet specific business needs, for example: weighing, preparing and mixing, moulding, proving and baking dough products using automated machinery processes as well as wrapping/labelling finished products, planning your work, handover procedures and recording production operations. Developed by Improve Ltd (changed to NSAFD (National Skills Food and Drink Academy)), the sector skills council for the food and drink manufacturing sector, the SVQ in Food and Drink Operations is awarded in partnership with SQA and Improve (NSAFD), SQA and SFMTA (Scottish Federation of Meat Traders Association) or SQA and Scottish Bakers. It is available through employers and training providers. The SVQ in Food and Drink Operations (Automated Plant Bakery Skills) at SCQF level 5 is a new addition to the suite of SVQs for Food and Drink Operations and complements the SVQs in Food and Drink Operations (Bakery Skills) at SCQF levels 5 and 6. It is designed specifically to meet the specialist skills needs of the growing automated plant bakery sector and recognises the growing use of technology in this sector. Due to the practical, competence-based nature of this qualification, it must be delivered in the workplace or real work environment. Simulation is not permitted under the Assessment Strategy. It may be delivered full-time or part-time. The achievement of other awards in the Food and Drink sector such as the NPA in Food Manufacture at SCQF level 6, Health and Food Technology at National 4/5 or SVQ 1 in Food Preparation may contribute towards the knowledge and understanding required by the SVQ. This SVQ is suitable for those working in a bakery as machine and process plant operators, who would like to obtain a formal qualification in the bakery sector. No prior qualifications are required to undertake this qualification, although experience in/knowledge of baking and bakery production processes would be an advantage. This SVQ must be assessed in the workplace — it is only suitable for those who are employed or are in work placement in the food industry. For general information on how to assess this qualification, please refer to the document Guidance on how to assess SVQs. For detailed guidance on how to assess this particular SVQ, please refer to Improve’s Assessment Strategy (335 KB) 2013 . Assessment will be through a series of practical and theory-based assessment or tasks. The Assessment Strategy does not allow simulation. GJ3M 22 is jointly awarded with Scottish Bakers. GJ1L 22 is jointly awarded with NSAFD.